ALSO: LOCH LOMOND FREEZING UP FOR FIRST TIME IN HALF A CENTURY??? Note the snow depths above my knees! strong, icy winds blowing drifts back on the the road! cutting visibilities in places to near zero! Snow drifts almost bury these fence posts! Not often do you need a digger! The contrast couldn’t be bigger. No snow, wet ground and heavy rains persisted throughout Thursday here at the lower elevations of Lennoxtown, yet just 10 minutes away up the Crow Road and into the Campsie Hills, the snow is lying which of course I did expect since I could see it from my office, another 5 minutes further on from the car park at the top of the Crow Road and the snow lies deep , you enter another world, a world where there is snow lying knee deep and where drifting has occured in the near gale force winds of yesterday, drifting is at or near, waste deep! These photos below are from the DAY BEFORE the images above! Another view of the snowfalling.. The best picture to describe yesterday, messy! As we close winter 2009-10 across the UK, yesterday after a day spent across the Liverpool area, I drove back north on the M6 and stopped at the Charnock Richards services looking at a sunset and dark orange horizon which soon dissapeared and all we could see was a brilliant display of stars. It was a cold night after a day which saw my wife, mother-in-law and I shiver in what was in my opinion one of the coldest feeling days of winter. The wind, albeit fairly light, would cut right through to the bone..
It’s that time of year when the sun is shinning high enough in the sky that it looks invitingly warm, only for you to open your door to a windchill of biting force. This February is expected to be the coldest in 24 years for Britain and as nights across the Highlands of Scotland repeatedly fall into the -15 to -18C range under brilliant clear, starry skies and still deep snowcover and days which continue to struggle to hit freezing, we have seen a winter which has felt as though it’s never ending this year. It’s been a cold month and winter overall here and throughout Britain as well as the Highlands. Snows remains over the higher terrain of England and Wales as well as a large area of the central Highlands of Scotland where the snowcover has remained deep and unmelted since Dec 17th. With heavy snows falling across Wales and southern and central England today after yet another very cold night last night, the north of England and southern Scotland is expected to see the snows from the south arrive and spread north throughout this evening and through the overnight hours, arriving into the heart of the Scottish central belt by morning. Here at my house temperature station, we stayed clear and calm and those fine conditions for cooling allowed our temperature to hit 19 degrees this morning which was the lowest reading of February and the lowest since early January. This morning marked a new montly low in the midst of a very impressive and rare streak of sub-freezing nights and an unusual number for February. Tonight is expected to be night 18 out of 24 below freezing for this month and would mean February falls into second place for most nights below freezing. As cold as January may have been, it would be come in third place after 23 nights below in December and now sitting 17 nights below for this month, we have a good chance at either tonight or the coming nights to beat January and that would make February second place in most nights in a month below for the three month meteorological winter period. Tonight, after a day of morning sunshine, winds have freshend out of the east and skies have become increasingly cloudier out of the south. Skies to our north have remained clear. The air temperature has remained at 35 degrees all day after only managing to climb to freezing around noon. Winds have made the air feel well below freezing all day and like yesterday, has felt like we’ve seen the coldest feeling days of winter thanks to icy winds which really nip exposed skin. Snows tonight will increase north and should hit the southern uplands of Scotland through this evening and we may well see snow flakes start to fly across the Glasgow, Edinburgh corridor by 10-11pm and this should continue along with an increase in easterly winds which combined with a freezing or near freezing air temperature should make for a bitter night to be out in. Drive with care especially over higher ground throughout the night and this snow may hit harder across the populated central belt of Scotland during tomorrow mornings commute, snarling traffic. Where is likely to be hardest hit tonight and into tomorrow? The classic high areas of Cumbria (Shap summit area may be hard hit by 2-6 inches) and over the M74 between Beattock summit and between Abington and Happendon services where the ground is high and exposed to strong crosswinds. At least 1-2 inch accummulations for the low lying areas. 2-4 is possible in the higher ground of Lanarkshire and Ayrshire especially over Fenwick moor (Ayrshire) and around Wanlockhead and Leadhills (Lanarkshire/Dumfries and Galloway). Somes areas exposed to upslope orographic lift may see 6 inch or more amounts with blowing and drifting. Even after the heavy snows depart, strong winds may bring blowing and drifting as well as knife-edge wind chills..
A very good morning to you all and I’m sure like I am, you are waking up to a coating of snow this morning but really what I making it much worse is the fact that combined with a temperature right around freezing and a howling east wind, it’s rather raw out there for your morning commute. Currently it’s 32 degrees as of 8am and with an approximate wind blowing at 20 out of the E it feels like 19 degrees out there and even lower when gusts are considered. Yes, it’s snowing and yes it’s blowing hard on that stinging wind, accummulating not that much and I really am not sure how much of an accummulation we’ll actually see. Here perhaps an inch or two when all is said and done and that is likey for most low areas. As far as the higher ground goes and particularly areasexposed to the wind, may pick up as much as 2-4 inches and some localised 6 inch amounts are possible. Further north and across the Grampions I wouldn’t be surprised if some areas collect 6-12 inches and a foot is very likely in the upslope areas above 2,000 feet. Conditions across the mountains today, particularly munro level will be life threatening with a combination of white out conditions, gale to hurricane force winds and wind chills perhaps -20C or lower. As well as fast accummulations and fierce blowing and drifting. The covering of snow we got yesterday was gone by evening. After windblown snow fell throughout the day from the early morning hours till 2-3pm in the afternoon. From a low of 32, the air temp remained at 32 till early afternoon, nosing up to 33 which remained at that figure until around 10pm last night, eventually topping a high of 34 by late evening last night. Snows lightened up around 3pm and then rains began to fall with even a lightening up of the stiff winds that howled all day and kept the realfeel between 17-22 degrees all day. Blustery cold winds and heavy rains continued to batter east exposure windows all night and made for a very poor night to be out, Messy was no word for it. What was interesting was how rains fell in 33 degree air. Plenty cold enough to support snow, so I do believe we had cold air trapped here at the surface but warmer air was wrapped in aloft, forcing the precip to turn to rain despite a cold surface reading and well below freezing windchills. Yesterday was a day which I would describe as one of the bleakest days this winter with a strong wind roaring through trees, rattling street lighting, blowing unlocked gates open and even blowing over bins, those winds along with a temp of 32 degrees, made for a horrible day to be out in with persistent snowfall which whipped horizontally across a wet, windy environment. Though the hills as you can see from my picture above is very white this morning and a cold rain and breezy conditions prevail down here, a car drove into our street and is covered by about 5-6 inches of snow, meaning not far from here a good 4-6 inches of snow was dumped, likely wherever that car came from, there was no turn to rain and likely may still be snowing now. What I was aware of with this snowfall was that though it has rained all day here and temps have been in the milder upper 30s. Snow has been continuing to fall and accummulate further north. I had had several surprises from the weather across our country over the past 24 to 36 hours now. What I didn’t realise was the snow up the Campsie Hills which tower just north of the house here, had 4-8 inches of snow and in places 10 inches of snow on top. I also didn’t realise that snow accummulated to depths of 12-20 inches yesterday and through the overnight hours and places such as Aviemore and throughout Aberdeenshire were getting dumped on…. Heavy rains here right now will be heavy snow further north where the air is colder and particularly at higher levels. 2 feet of snow from yesterday will likely be 4 feet of snow by the end of today into tomorrow and there is more snow for the rest of today and through tomorrow. So how much snow will there likely be by the end of tomorrow? 4-5 feet in places??? What I will say is this, many places that haven’t seen there snow dissappear from before Christmas are likely witnessing the MOST snow on the ground since it arrived and that’s tough going for these folks… I forcasted back in January that during February we may see the BIGGEST snowstorm of the entire winter and see the deepest snowpack. Well though it may not have occured here and across the greater Glasgow area, this IS THE CASE across many areas further north!!! AGAIN I STATE MY IDEAS…. The collision between Atlantic moisture surging north from the southwest Atlantic and Arctic air from the north and east has produced the BIGGEST SNOWS OF WHAT HAS BEEN A SEVERE AND TIRING WINTER… My forecast ideas have become true and I am proud at the forecast I have put out…. 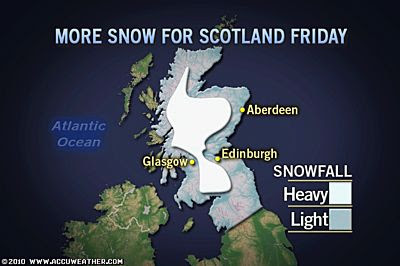 >heavy snow brings slushy pavements to scotland. Out what a big deal! i think your news of a snowy Moscow was more exciting, as I'd never have expected that. – 18 C in Scotland? It hits that every winter in the highlands. I feel that you should be concentrating more on the significance of a frozen Lochgelly. >I drove to St Andrews today and was surprised to find it was still under snow from a fall which hit Fife last Friday. The east of Fife, and East Lothian were worst hit by the falls. As I drove today, there were snow flakes blowing through most of the way, and the wind amplified the effect.